LAKEVILLE, Connecticut (May 30, 2018) – Shaking off a frustrating race-start penalty for the second Pirelli World Challenge SprintX event in a row, co-drivers Mike Skeen and Scott Heckert co-drove the No. 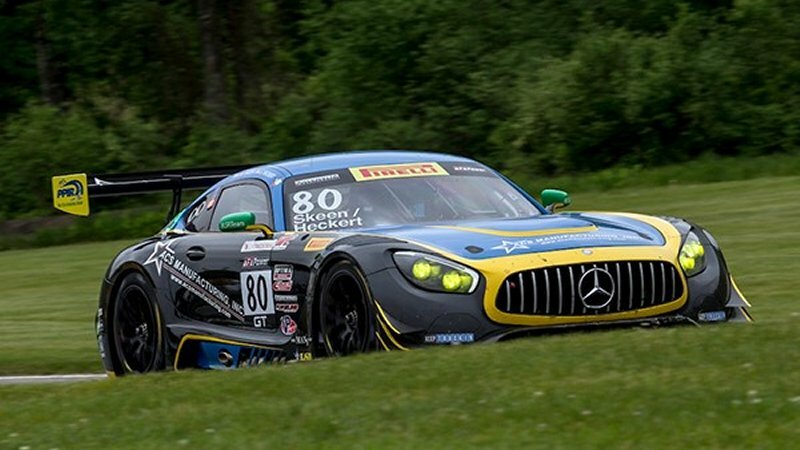 80 ACS Manufacturing/Lone Star Racing Mercedes-AMG GT3 to a top-five GT Pro-class finish in the second race of Memorial Day Monday’s doubleheader at Lime Rock Park. Rounds 5 and 6 of the 10-race Pirelli World Challenge SprintX series, Lime Rock featured the only same-day doubleheader on the 2018 schedule. The Memorial Day event got off to a promising start as the Lone Star Racing No. 80 and Skeen were moved to the pole position for the start of Monday’s first race. Having qualified a close second on Saturday, Skeen instead was elevated to the pole when the original fastest qualifier had a technical infraction. The pole was the second in the year’s first three SprintX race weekends for Lone Star and Skeen. Skeen edged into the lead at the start of race one only to come together with another competitor as he had to hug the inside line entering Lime Rock’s Turns 1 and 2 “Big Bend” section. Race officials ruled Skeen had “incident-responsibility” for the contact a few minutes later, the second time in the last two SprintX races where Skeen and the Lone Star team were hit with a penalty for what appeared to be a “racing incident” in the opening seconds of an event. Never having the chance to battle for a good result in the opening round, starting driver Heckert quickly moved off to a competitive start in Monday afternoon’s final one-hour race. He made a pass for position and was ultimately up two spots to sixth overall by the completion of lap one. Skeen took over from Heckert halfway through Monday’s final race and maintained the No. 80’s position of fifth in GT Pro and sixth overall to the checkered flag. Despite the pair of disappointing results, Skeen, Heckert and Lone Star have put together a solid record of four top-five GT Pro finishes in the year’s first six SprintX races. The record includes podium finishes in half of the year’s races, including a victory last month in Round 4 at VIRginia International Raceway (VIR) and second and third-place podium finishes in the season-opening doubleheader weekend at Circuit of The Americas (COTA) in March.